Most Limestone buildings are now equipped with at least one gender-neutral washroom for anyone who desires increased privacy regardless of the reason. 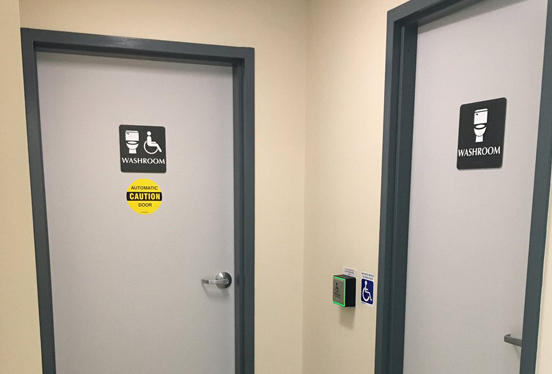 Students, staff and visitors in the Limestone District School Board now have access to gender-neutral washrooms at many schools with the introduction of new signage. Limestone began designating single-stall and accessible single-staff washrooms as “universal” or gender-neutral in the fall of 2015 in secondary schools. Now, more than 220 bathrooms at secondary and elementary schools across the district have been re-signed. All recent new builds have at least one universal, single-stall washroom on each level. The Board has also developed draft guidelines for supporting and protecting transgender and gender non-conforming student and staff rights. Feedback on the new guidelines is currently being sought from stakeholders. The Board will also be investigating gender-neutral change rooms. For now, students and staff can use universal washrooms for changing purposes.